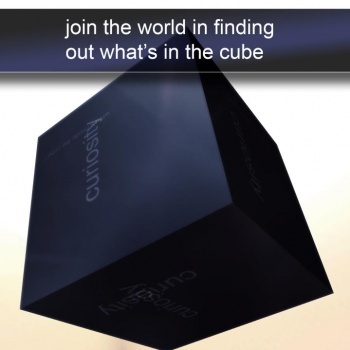 Peter Molyneux's Curiosity now lets you pay to keep other people from finding out what's inside the cube. Believe it or not, Curiosity: What's Inside the Cube, the first of Peter Molyneux's 22 Cans "experiments," is still grinding away. In case you've forgotten, Curiosity is the game with the cube and the big secret inside that will be revealed only to the person who chips away the very last "cubelet," a process that will be complicated somewhat by the latest update to the game. Players can now pay to remove cubelets in blocks of 10,000 for 99 cents, 100,000 for $6.99 or 500,000 for $10.00 - but they can also opt to pay the same price to add the same amount of cubelets to the cube. It's a strange option to add to a game that's all about discovering what's inside, but in a way it fits with the experimental nature of the thing. "We don't know quite what will happen in this war of attrition," the studio said in the update. "Curiosity may very well rapidly degrade to reveal its innermost secret or maybe the effects of automatically removing cubelets will be neutralized by players keen to keep Curiosity going,"
Cubelets will not be added or removed immediately under the new payment scheme, but will instead be handled when the cube goes to its next layer. As of early this morning, roughly 13.7 million cubelets were set to be removed from the next layer of the cube, while 4.7 million will be added, adding up to a net reduction of (get out your calculators) 9 million cubelets.